What is the Provenance of Vermont Vital Records? This is part 2 of the Series: Vermont Vital Records Research. It contains an abbreviated timeline of laws affecting the compilation and storage of Vermont vital records. 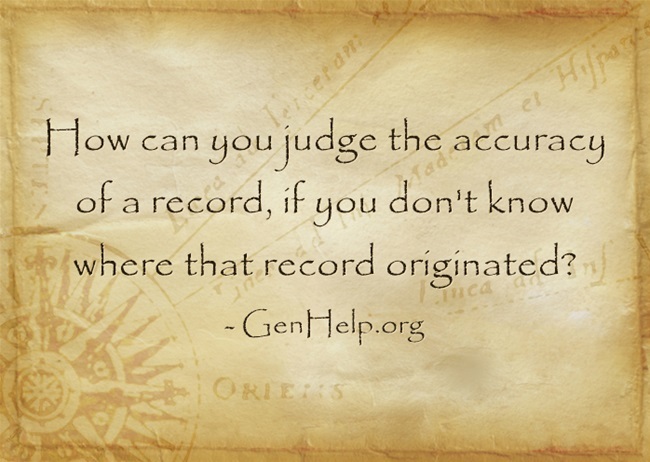 How can you judge the accuracy of a record, if you don’t know where that record originated? The first thing a researcher should do when encountering a database is to find out the provenance1 of the original source. Establishing provenance is a needed step in the Data Collection Standard as published by the BCG (Board for Certification of Genealogists)2. For genealogists, we would want to identify the record of ownership of the documents referenced (and often imaged) in the online collection, as well as ownership and creation of the database itself. While each individual database has it’s own provenance (and we’ll discuss those on each database page), the records they depict, also have their own history. To get a better overall understanding of the creation of vital records in Vermont throughout history, I have created the following abbreviated timeline. 1779 – Town clerks mandated to record all births, deaths and marriages recorded in their towns. These records were held at the local level. 1886 – State Board of Health was created in Vermont. 1896 – In 1896 the state of Vermont passed an act5 requiring county clerks to submit records of divorces occurring within their county, including the number and cause, to the State Board of Health. 1902 – In 1902 town clerks were required7 to begin submitting their returns bi-annually (March and September) to the State Board of Health. After the State Board of Health prepared and published the vital statistics tables required by the State they would then submit the returns to the Secretary of State Office for binding, indexing and preservation. 1904 – Town clerks were required8 to continue submitting bi-annually their vital returns, except the months of submission were changed to January and June. County clerks were required to submit their returns for divorces as well bi-annually. These returns would then be forwarded to the Secretary of State for binding, indexing and preservation. 1908 – In 1908 the law was changed to require9 monthly reporting. In 1908, the Secretary of State was required to create a card index for any records in the custody of the Secretary. Unfortunately, not all towns complied with the prior Acts, and the Secretary of State did not have a complete list, so this registry is considered incomplete. 1921 – Act 92 of 1919 was reintroduced in 192112 and the State of Vermont put some teeth behind the act, threatening to procure the towns records at the towns expense if they did not comply with the Act. 1930‘s – Acts were created to handle citizens amendments to Vital records (corrections, additions, etc.). 1949 – The State Board of Health was reorganized into the Vermont Department of Health. 2008 – The 1980 arrangement remained in place until July 1, 2008 when the now Division of Public Records merged with the Vermont State Archives to create the Vermont State Archives and Records Administration, which is a division of the Office of the Secretary of State. There are several years in the timeline which provide important information concerning the records we will be using in our research. Vital records in Vermont were first required to be collected by town clerks starting in 1779. Unfortunately, you will find that not all clerks followed this requirement. So each town has its own specific starting date. Up until 1857, those records were compiled and held only by the respective town clerk. The most important date for genealogists are the acts of 1919 and 1921 where the State of Vermont required all Vermont towns to compile from the original records, churches and cemeteries, the vital records information. Notice in the timeline that compliance was a particularly difficult process to insure, as until 1921, there were no detriments for the town if they did not comply.